Some companies prefer not to employ a full-time bookkeeper, and the owner may have decided to allocate his or her time on generating revenue and making key decisions, not bookkeeping. Our service includes reconciling bank statements, credit cards, and loan statements. Use your check stubs, bank statement, and sales records to produce a monthly (or quarterly) income statement and balance sheet. Keep a comprehensive record of how much your small business owes creditors and how much is owed to you. Record how much you have invested in equipment and inventory. Prepare your sales tax form for filing. We will discuss your financial statements with you in as much detail as you require, so that you can make the decisions you need to for your business. QuickBooks accounting software programs are ideally suited for small business owners. 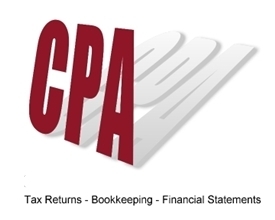 These programs have simplified the bookkeeping process for you. However, no accounting package can be operated properly without sufficient understanding of its features and functionality. It is a must for business management to complete the set up and installation properly. That's why as Certified QuickBooks Pro Advisors we work with many of our clients to train them, provide ongoing assistance, and immediate answers for trouble shooting.